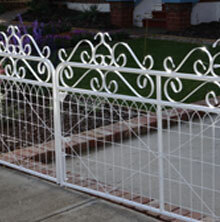 Finish your home with an ornamental gate from Big Red Wire. Handcrafted to the true heritage style, our gates add charm to traditional and new homes. At Big Red Wire, we have several styles of gates to choose from. Our friendly team will help you select the right style for your home, and can match it to your woven wire fence to complete the look. Our gates can be adapted to fit any widths, and can be used for driveways. 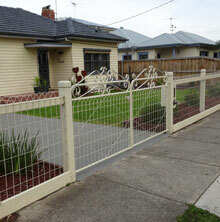 Whether to keep the dogs in or the neighbours out, these gates are sturdy and built to last. With a range of powder coated colours to choose from, you are guaranteed to find the perfect match for your home. You can choose the classic galvanised finish. Contact Big Red Wire today to learn more about our range of ornamental gates. BIG RED WIRE IS DEDICATED TO PROVIDING THE VERY BEST SERVICE AND QUALITY TO OUR CUSTOMERS. WE REMAIN ONE OF FEW FENCING MANUFACTURERS THAT ARE 100% AUSTRALIAN OWNED AND OPERATED. Website maintained and hosted by Website Connection © 2019 Branson Building Material.